Brown beef in a skillet over medium heat; drain. Stir in tomato sauce and seasoning mix. Bring to a boil and remove from heat. Combine cooked macaroni, sour cream and 1/2 cup Cheddar cheese in a bowl. 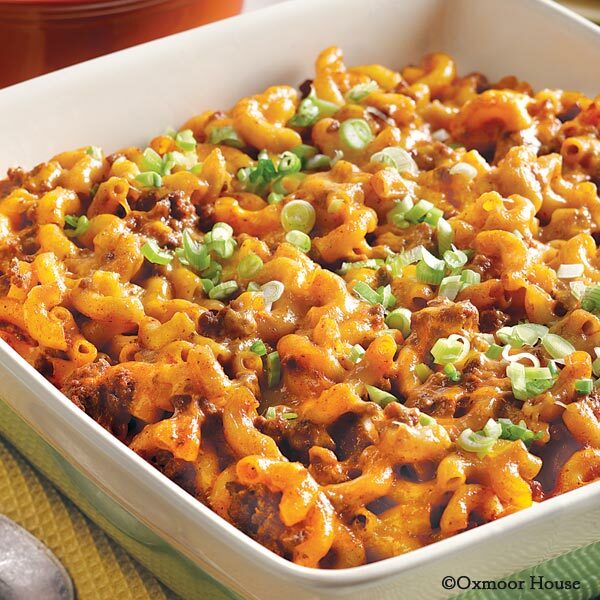 Spoon macaroni mixture into a lightly greased 13”x9” baking pan. Top with beef mixture and remaining cheese. Bake, uncovered at 350 degrees for 30 minutes, or until hot and bubbly. Garnish with green onions. Serves 6. Enjoy this recipe from Big Book of Country Baking originally published 2013.